You are invited to host Archangels Michael, Gabriel, Raphael, Uriel and Metatron from FRIDAY, August 1st, 2014, and then you can find three people to host them from August 10th and so on (5 24-hour days on, 5 off, etc… don’t get too hung up on the math!). The Archangels stay with you for 5 days, bringing healing, support and much more to assist you and your journey. They have five days off in between the people who host them before they move on. You, your home and everyone and everything in your home will be blessed by the angels during the time of their visit with you. It helps to bring more light and peace and love to your home. The hosting of the Archangels was started in New York in 2010 through someone’s spiritual guidance. It is an honor and a gift to allow your family and home to be imprinted with their LIGHT, but it does ask for your personal participation. Keep in mind that by hosting the five Archangels, Michael, Gabriel, Raphael, Uriel and Metatron, you are assisting them to serve humanity, Mother Earth and all universes in more direct ways and they thank you for your willingness to participate. Archangel Michael is the Head Archangel. His name means “One who looks like God.” He helps to clears toxins associated with fear, assists in people’s life purpose and career path, abundance, protection, defense, power, justice and strength. He is in the position of South. Uriel assists with enlightenment, heals every aspect of your life, unconditional forgiveness, peace. He is in charge of the nature spirits and is in the position of North. Raphael is healer of mind, thoughts, body and soul, custodian of The Tree of Life (Kabala), God’s Physician. He is the angel of divine healing and is in the position of East. Gabriel brings good news in abundance, discerning messages received and what we give out. 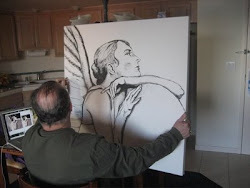 He is a messenger between Heaven and Earth, communication, writing & art. He helps with balance of energies. He is the angel for announcing and carrying our prayers and intentions to God and stands in the position of West. Metatron looks after children, led the children of Israel out of the wilderness. He can transmute time and space, sacred geometry. Some say he is the overseer of all of the angels and nature spirits. They all work with God to make sure that you are kept safe and protected. In these times of so many earth shifts and changes on the planet, it is very helpful to know and work with the beings of light who help us work with the energies of earth, air, fire, and water and who can help us restore peace and harmony to Mother Earth. So I hope you will feel called to invite them into your home and heart. An envelope containing a letter with 3 wishes. One for Mother Earth. One for your Family. One for You. Formulate the wishes the most simple way. Not too many details. Summarize the best you can. On the envelope, you will put an apple that you will eat after they leave. The house should be tidy. “Please enter Archangels, and be welcome. You were sent to me from Jeanine Sande (fill in name of person who sent them). Thank you for coming here and for enveloping my home, all within, and all who visit, with purity and peace. Thank you for having chosen to come here and bless my life and the lives of the people around me with Harmony, Love, Joy, Wisdom, and Strength. From that moment, the Archangels make things happen! It is recommended to meditate and to ask questions during the day. There is no limitation. TRUST. They can be in more than one place at a time. When you go out, you can ask them to come with you, if appropriate. You can sit at a table with a piece of paper and a pen and ask questions around 10:30pm. You will easily get responses this way if your other spiritual channels are not already opened. You may be awake between 3am and 5am with insights and guidance. Start to prepare the list of the names and addresses of the 3 people who you will ask the Archangels to visit after you. Open your front door and wish them a good trip. Burn the envelope with your wishes in order to free the energy to allow them to happen. Take the ashes and drop them in a stream of water (not stagnant water). If you live in a cold country, the kitchen sink is acceptable as the water will be recycled to Mother Earth. Express your gratitude. Eat the apple. It will contain lots of good nutrients and more for you. Place the flower outside directly on Mother Earth so that it recycles in a natural way. Send this Ritual to the people who will host them next. ** I need your name and physical address to send the Archangels to you! Please email me the info at lovechris@earthlink.net. PS Thank you Jeanne Sande for this beautiful write up! A look at my studio.... and a GIVE-AWAY!! Hello friends.... I encourage you to click over to my Spirit Dolls by Chris blog, for an update on the studio and a FREE GIVE-AWAY! It's DONE! 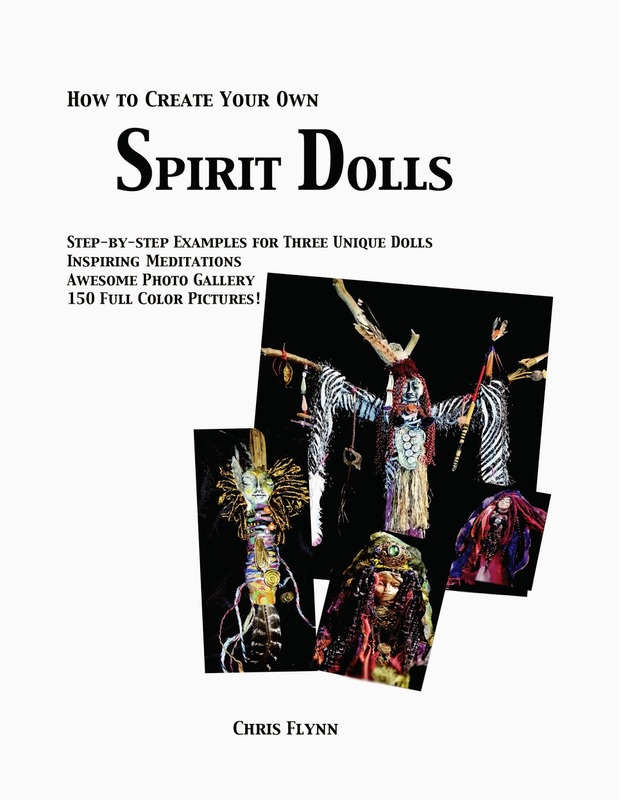 Just listed on Etsy, How to Create your own Spirit DollS! 80 pages, 150 color pictures, digital format (pdf)... User friendly! IMMEDIATE DOWNLOAD! Lots of fabulous examples! Instructions for three different style dolls! 3 meditations to connect you with your Sacred Muse! Hard copy will come out this Fall on Amazon. See it now, HERE! 65 The ‘Rest of the Story’ – Supplies You’ll Love!